We're looking forward to seeing travelers begin arriving for their summer vacations to Barefoot Resort. With modern accommodations, beautiful scenery and fantastic location just inland from the beautiful North Myrtle Beach coast, it's no wonder why so many guests return year after year! One of the best aspects of Barefoot Resort is its location right across the waterway from Barefoot Landing, a favorite destination of Grand Strand travelers for decades. Barefoot Landing is the home of the House of Blues, the Alabama Theatre, over a hundred specialty shops and boutiques and numerous restaurants. It's a great place to be year-round, but in the summer, this entertainment district really shines as they kick off SummerFest, a season-long celebration of sun, fun and good times in Myrtle Beach! SummerFest kicks off Sunday, June 1st with plenty of family-friendly fun and entertainment all throughout Barefoot Landing. Nightly entertainers stroll the boardwalk areas and byways of Barefoot Landing delighting visitors. "America's Got Talent" veteran Nick Pike will be a featured talent, exhibiting amazing juggling skills, even while on a unicycle! Kids are sure to love Nigel and Ally's Traveling Dance Party, roaming the area with lively song-and-dance numbers that are perfect for crown participation. Other entertainment features include magicians, clowns, face painters, stilt walkers and more! 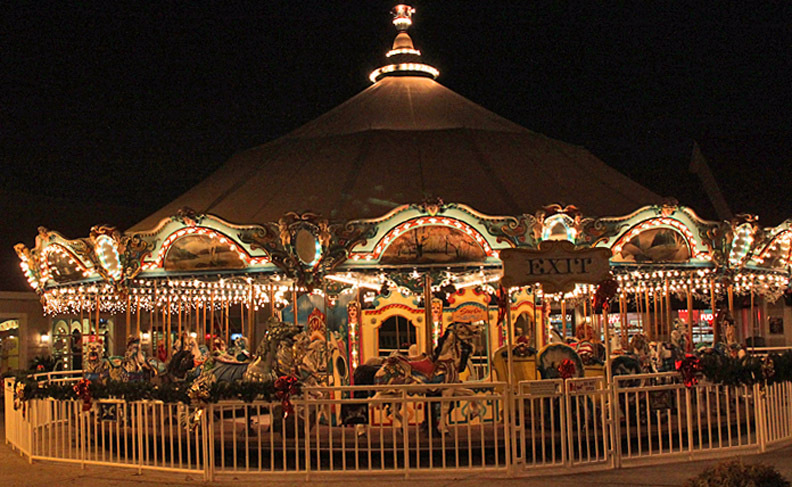 And every Saturday guests can ride the beautiful Barefoot Landing carousel for free, all summer long! Mondays are always a special night at Barefoot Landing, because that's when you'll witness one of the biggest and brightest fireworks displays to be found in Myrtle Beach! Beginning at 10:15 pm, a dazzling volley of pyrotechnics will light up the sky over Barefoot Landing. If you're a guest of one of our beautiful Barefoot Yacht Club or North Tower condos, simply step out onto your private balcony to watch the show across the waterway! From sunrise to sunset and on into the night, there's plenty of fun to be had at Barefoot Landing! Grab a burger at River City Cafe, fresh seafood at Flying Fish or a juicy steak at Castano's Italian Steakhouse. Pick up some souvenirs from great area shops like Tiki Jim's, Ron Jon's Surf Shop, Sunglass Hut, Peace Frogs or M.R. Duck's. Even check out the live tiger exhibit provided daily by T.I.G.E.R.S. Preserve! There's no limit to the great times you can have at Barefoot Landing! Best of all, you can stay right across from this great facility at our beautiful Barefoot Resort condos and golf villas. Be sure to check out our great specials like our Escape package, with the lowest summer nightly rates around!